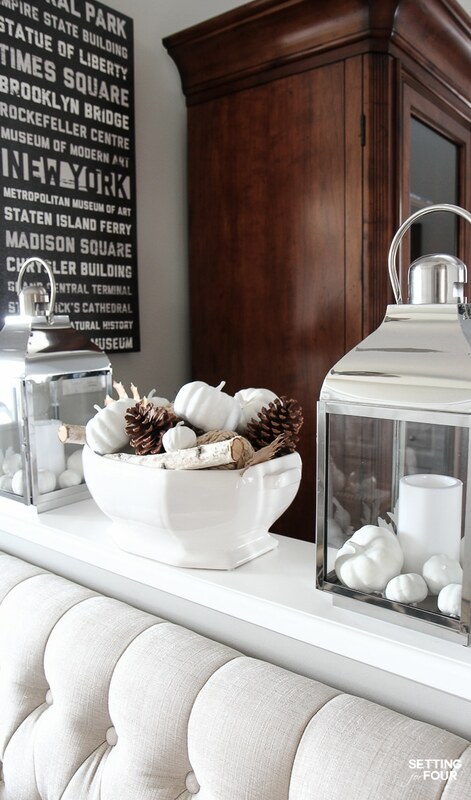 See my Elegant Fall Entryway Decor Ideas to add warmth and texture to your home for autumn! 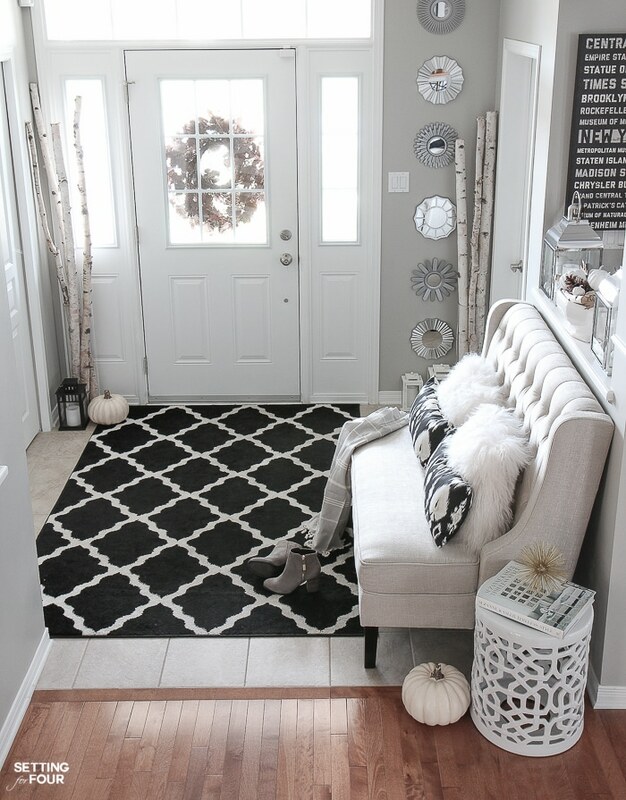 Don’t miss any of my Fall neutral foyer decorating tips including ideas for the perfect stain resistant entryway area rug, a stylish upholstered bench for seating, cozy pillows, lantern filler ideas, birch and pinecone accent decor and more to create an entryway you and your family will love! 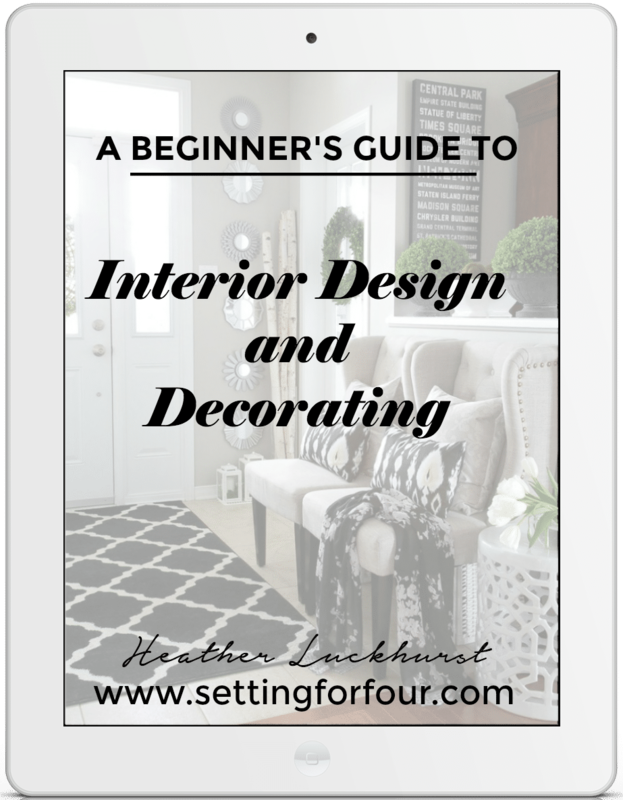 All of the furniture and decor items are linked up in the post so you can copy the look in your home! 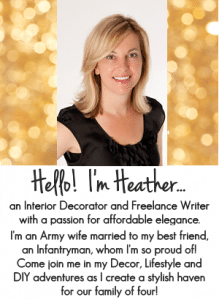 Get the look of my foyer! Click on each image to see more about each item. Scroll using the arrows to see them all! Hello friends! I’m back today with more Fall decorating ideas! (Did you see my Cozy, Rustic Fall Porch last week?) Today I’m sharing my Elegant Fall Entryway Decor – I hope you enjoy the tour around one of the busiest spots in our home! So let’s start the Fall entryway room tour! As a military wife I’ve lived in a LOT of homes with many different styles of entryways… from postage-stamp-tiny, to split level entry. I’m very fortunate that our foyer in this home is by far the biggest and prettiest I’ve ever had to decorate! 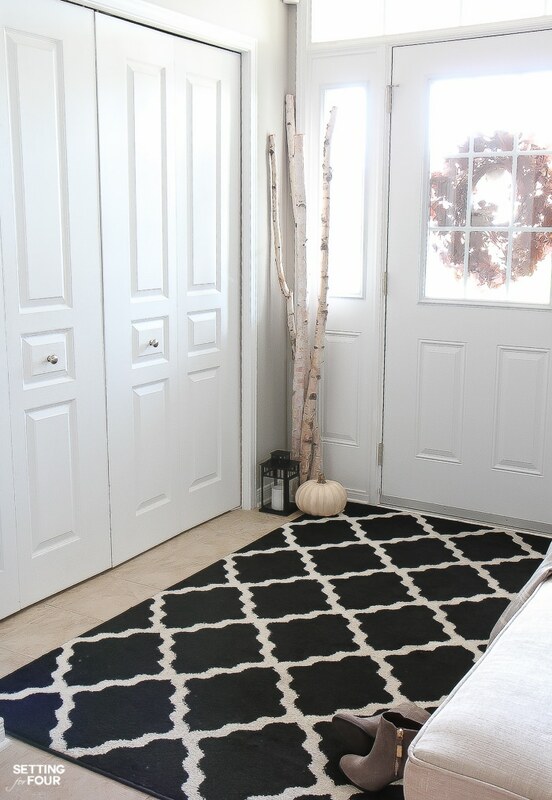 I kept this black and cream trellis area rug for Fall – it’s such a gorgeous patterned rug and it’s SO HARDWORKING! It’s a breeze to vacuum and makes dirt and stains stand out less – perfect if you have pets and kids (we have two boys…I can tell you that there isn’t a stain I haven’t seen!!!). Plus its incredibly soft! If you are looking for a beautiful entryway rug I highly recommend this one. This upholstered bench is so elegant with gorgeous button tufting, wingback ends, beautiful piping and gorgeous oatmeal colored upholstery! It’s soooo comfortable and is a fabulous spot for us to sit and put our shoes on! As an interior decorator I always recommend to my clients to add seating to their foyer, if they have space. For fall I added a couple of white pumpkins to our entryway, I couldn’t find real ones here yet so I used faux pumpkins. I filled the two empty corners of the foyer with two tall glass vases filled with white birch tree poles- I just love the natural look and texture of birch bark! It’s perfect for fall! The height of these birch filled containers draws the eye up and. Makes our foyer fell bigger. See my post on how to make a small space feel larger for more small space decorating tricks! 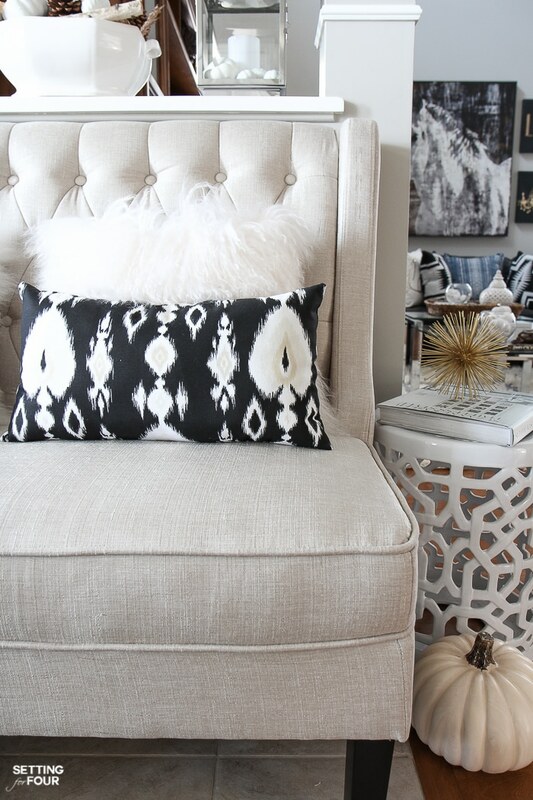 These black and white ikat lumbar pillows add a pop of contrast and pattern to our foyer- I’m a sucker for ikat! It’s a great pattern to mix with geometrical like the trellis pattern of our rug. I swapped out the indigo blue shibori pillows that I had in my foyer, in my summer home tour, for these pretty Mongolian fur pillows that add cozy Fall texture. Design Tip: Swapping out cotton throws and pillows for faux fur, velvet and knitted fabrics is an instant way to transition any room from summer to fall! This white garden stool is a handy spot in our entryway to set keys, mail and sunglasses down on. I picked it up at HomeSence/HomeGoods a couple of years ago. And….I’m obsessed with garden stools! There are so many ways you can use in in a home and they are terrific for foyers! One garden stool in a small entryway will provide a spot to sit, two will provide seating and a spot for mail and keys. I decorated our garden stool with an interior design book that I love – Timeless Style by Suzanne Kasler (she’s a brilliant designer for Ballard Designs!) – and topped the design book with a gold sea urchin object. It reminds me of the beautiful sea urchins we’ve seen scuba diving. On the shelf I have two silver lanterns that I love to decorate for the seasons! For autumn I added faux oak leaves and mini pumpkins that I painted white. The lanterns contain my go to flames candles on timers that turn on at dusk. They add such a pretty flicker and glow to our foyer in the evening! I picked up this ironstone tureen at a vintage store a few years ago – it was missing its lid but it’s perfect to use as a centerpiece! I also decorate it with the seasons! I filled the tureen with mini white pumpkins, gold spray painted oak leaves, pine cones and small birch poles – so inexpensive and such an quick and easy Fall accent. Literally a few minutes and your done! I’m all about quick and easy decorating! So that wraps up my Fall Foyer tour – I hope you enjoyed seeing my Elegant Fall Entryway Decor Ideas and found some interesting decorating tips here! PIN IT AND SHARE IT WITH YOUR FRIENDS! Now grab a cup of coffee and see more fabulous Fall foyer decorating inspiration! Cute scene Heather! Love all your attention to detail, the space looks great! Your entry way is so beautiful! Love the birch wood and the white pumpkins! Adorable! I love the new settee – there were two chairs before, yes? Great look! 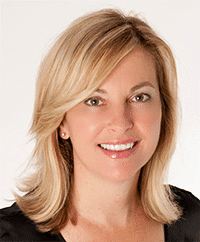 Thank you Shannon! Yes – I moved the chairs into our dining room! :) Happy Fall! This is so elegant and gorgeous! I have always wanted a high back bench like that in our entry way. Love it so much. Could you pretty please tell me what paint color this grey is?! I’ve been searching for a grey for weeks and I’m so overwhelmed! This one is perfection!! Where did you get those small mirrors from I love them & want to do that same look! !